I was surprised and delighted to find this sweet email in my inbox this weekend and had to share it! It's been quite some time. I just thought of you and Mike and wanted to drop a hello. 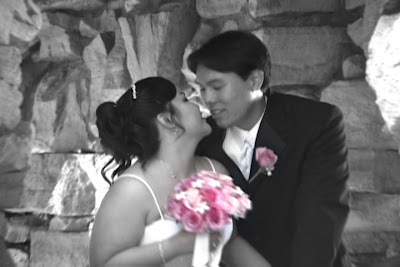 Stan and I were just feeling nostalgic and watched our wedding video. And I was gushing like a little baby. There were so many things I didn't remember until the wedding video reminded me of it. I am so glad that I went ahead and decided on having a videographer for my wedding. At first I thought a video was just duplicative of photos, boy was I wrong- and glad I was wrong! I remember we had this exact conversation when I was planning my wedding. We had our first meeting and you told me that couples would tell you after the fact that they would have regretted not going with a video. I am now one of those couples as well! The first thing that pulled at my heartstrings was seeing my grandfather in the video. He's older and significantly less mobile. And to see him in motion when he was well really got to me and brings back memories, happy ones. That's when it first made me realize how important it was to have my wedding day on video. It's funny, my sister is now engaged, and going through the same process and she too is going through the budget and thinking of what to cut out... I've had the same conversation with her- that videos capture things that a still picture camera can't. Was just feeling nostalgic and thought of you and how I really appreciated the excellent job you did on our wedding video.